The Adventures of Cassie: Is the Weekend Here Yet? I've been having a pretty hectic week so far, and I'll be glad for this weekend to arrive. Nate and I are going to see Verona Grove tomorrow night, they have been friends of ours for a while now, and they are moving up in the world, and will hopefully be on MTV one of these days. Also, Johnny and Tabitha are coming up for a visit on Saturday, which we are excited about. Lastly, on Sunday the Packers play the Bears, which should be fun because all of the neighbors in our apartment are Bears fans, and we may have some of them over to watch the game in all of it's big screen HD glory. 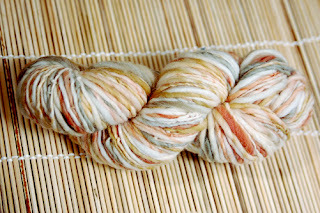 Crafting is going pretty slowly this week, but I do have a skein of yarn to show you. This is some of my newly dyed merino yarn , and I've got two skeins of it. I think I will be keeping this one for myself seeing as it is so soft and squishy. 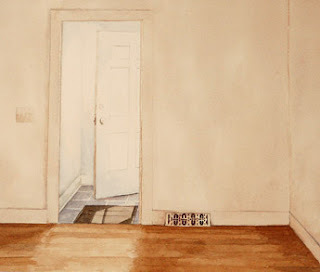 I've also been starting a new(ish) series of paintings of the interiors of empty houses. I think I may transfer this series to oils though in effort to get more done. This is the first of the series, but it is only halfway done. I think this will be a good series for oils, I'm looking forward to working in the studio this weekend, hopefully I'll have some more finished paintings to show you soon. I love, love, love your colorways! They are soo scrumptious! Cassie, thanks for visiting my blog. I have so enjoyed reading yours. Your painting is incredibly awesome (I'm a closet watercolorist). I'm a PackerBacker from Michigan's UP. Mmm, your yarn looks so squishy and yummy!